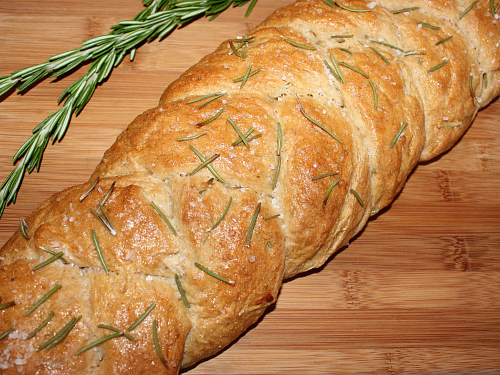 ryan and i love rosemary, and we absolutely love the rosemary olive oil bread from wegman's. however, at about $4.50 per loaf, it is something that we only get once in a while. 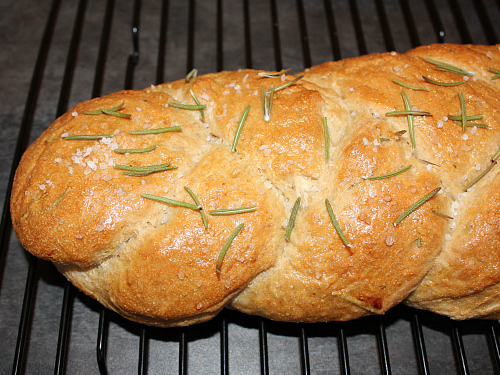 last week, we made eggplant parmesan for dinner and we were both craving some rosemary bread to go along with our italian meal. instead of buying a loaf from the grocery store, we decided to make our own. in addition to bread flour, we also used white whole wheat flour to make the bread hearty. 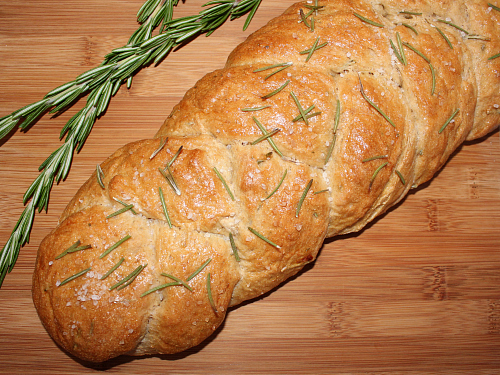 we loaded the inside of the bread with fresh rosemary (you can never have too much rosemary in our opinion). instead of making a rectangular loaf or a round loaf, we opted to braid the bread for a little extra pizaz. we brushed the top of the bread with an egg wash and then and we topped the bread off with additional fresh rosemary and some sea salt too. it smelled wonderful as it baked! to be authentic, we dipped it in olive oil when we ate it (instead of spreading butter on it). 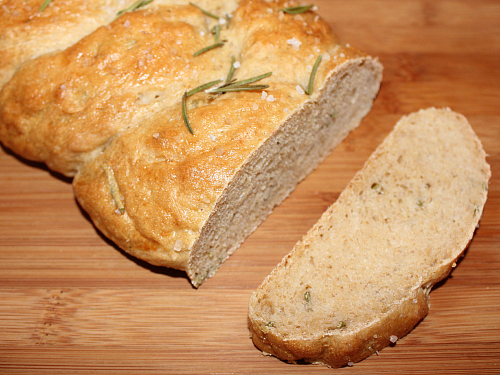 this bread was the perfect compliment to our italian dinner! in the bowl of an electric mixer, fitted with a dough hook, combine the warm water, sugar, honey, and yeast. stir gently and let sit for 10 minutes to activate the yeast. stir in the rosemary, seasonings, and olive oil. in a separate bowl, sift together the two flours. gradually add the sifted flour until a dough ball forms. using the dough hook, knead the dough for about 5 minutes until smooth (adding additional flour as needed if the dough gets too sticky). remove the dough from the mixer and place it in a lightly greased bowl, cover the bowl with plastic wrap and a kitchen towel and let the dough rise in a warm place until doubled in size (about 1 hour). punch the dough down and separate the dough into 3 even pieces. roll the dough between your hands to make 3 long ropes of dough, then braid the 3 ropes together. 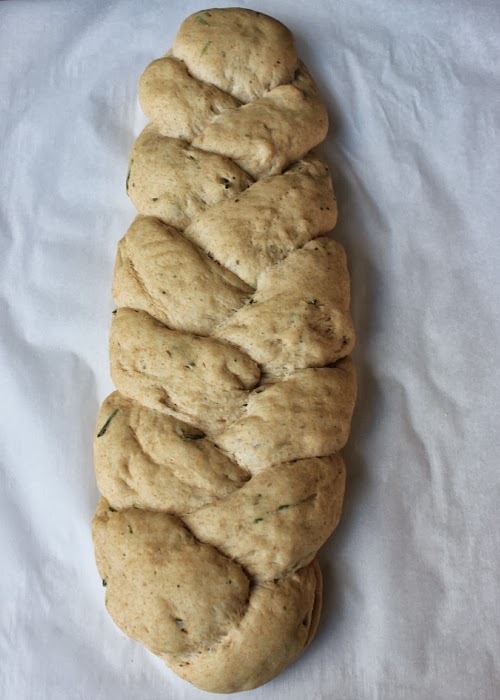 place the braided bread on a cookie sheet lined with parchment paper. cover the dough with a kitchen towel and let the dough rise in a warm place until doubled in size (about 45 minutes). 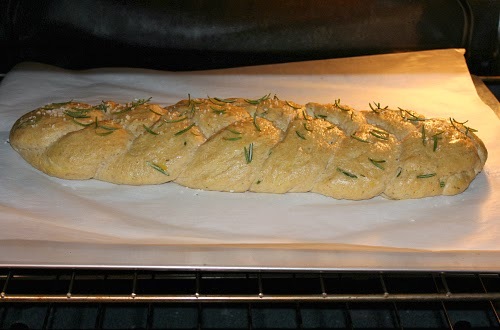 preheat your oven to 400 degrees F. gently brush the top of the dough with the egg wash and sprinkle additional fresh rosemary and sea salt over the top. bake for 25 minutes until the top is golden brown and sounds hollow when tapped. 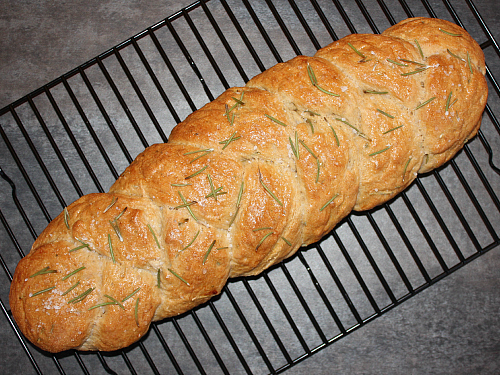 I've made this type of bread before, though not for awhile. I actually used this exact recipe. It's good. Isn't it?! That looks delicious. I bet it was better than Wegman's bread.